Thousands of cleaners are busy separating plastic from other rubbish as more than two million Muslims wrap up a pilgrimage to Mecca that presents a huge environmental challenge for Saudi Arabia. The Mamuniya camp in Mina near the holy city is dotted with colour-coded barrels -- black for organic waste and blue for cans and plastics for recycling. It's all part of an initiative to reduce the environmental footprint of the hajj, one of the world's largest annual gatherings. More than 42,000 tonnes of waste are produced during the pilgrimage to Islam's holiest sites, according of Mohammed al-Saati, head of sanitation for the Mecca municipality. "We're facing some real challenges, primarily the sheer volume of waste produced ... along with the number of pilgrims, the limited space around the holy sites, different nationalities and the weather," Saati told AFP. "Islam as a religion does not encourage excess," he added. "Pilgrims can be friends of the environment. It starts by raising awareness back home." The hajj, which started on Sunday and ends on Friday, drew nearly 2.4 million Muslims from around the world this year, according to official Saudi figures. More than 13,000 sanitation workers and supervisors were hired during the pilgrimage season, which saw temperatures rise to 44 degrees Celsius (111 Fahrenheit) this week. A handful of camps in the town of Mina, the site of the symbolic stoning of the devil ritual during hajj, have begun to implement plans to turn "green", cutting back on waste and encouraging pilgrims to do their part. Banners hanging near the Kaaba, a black structure inside Mecca's Grand Mosque towards which Muslims around the world pray, also featured the recycle logo this year. Authorities aim to cut waste volumes by two-thirds by 2030, Saati said, with a plan that speaks to both environmental ethics and religious belief. Sorted waste collected from the pilgrimage sites will be sold to companies that handle recycling. All proceeds will be given to charity in standing with the Muslim belief in "sadaqah," or voluntary donations. 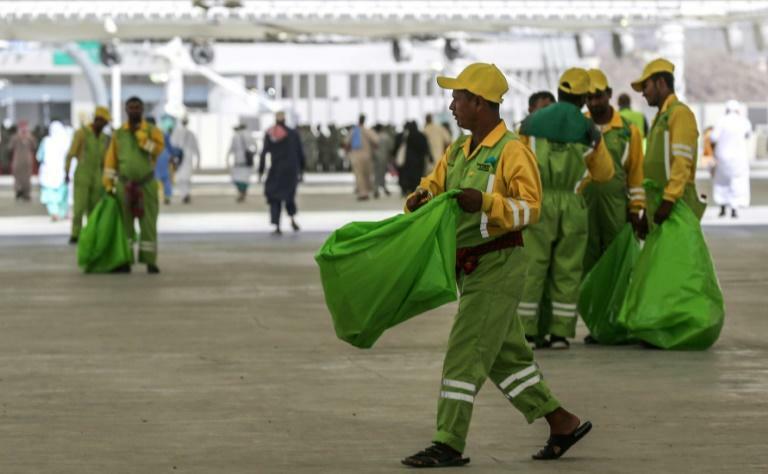 Workers in bright green vests made their way across the streets and alleys, picking up soda cans and plastic water bottles as pilgrims packed their things to return home. Signs encouraging pilgrims to sort their waste could be seen across the Mamuniya camp -- along with signs reading "Sadaqah, not litter." "The idea of an environmentally friendly camp is really important to us, to preserve the sanctity of the site," said Hatem Mumena, the camp's general manager. But he admits there is still far to go, as the numbers of pilgrims attending hajj is expected to rise. 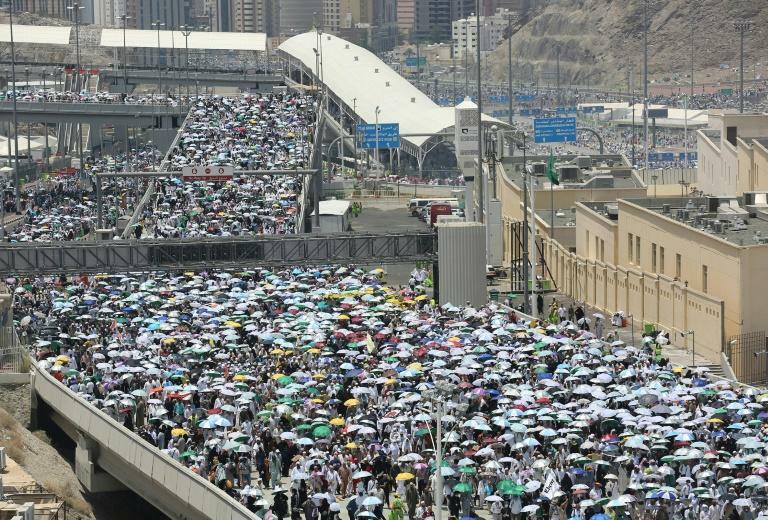 Saudi Arabia hopes to welcome some 30 million pilgrims per year by 2030. "This is just the beginning," Mumena said.